Doppelgängers! Even Freud would be creeped out. When two people bear a striking resemblance to one another, we often call those similarities uncanny. The word is so rarely used outside that context, in fact, that we may forget its most basic definition: “seeming to have a supernatural character or origin.” For two things to have a truly uncanny resemblance, simply looking alike isn’t enough — they have to arouse discomfort for being nearly, but not entirely, identical. The more alike they are, the more unsettling their small differences become. With that in mind, what could be more uncanny than a quartet of doppelgängers that aren’t quite identical to their “tethered” other halves, as they’re called in the film? It’s no coincidence that the first meeting takes place amid funhouse mirrors, which distort our perceptions and draw attention to features we usually overlook by exaggerating them to the point of humor and, at the proper angle, fear. 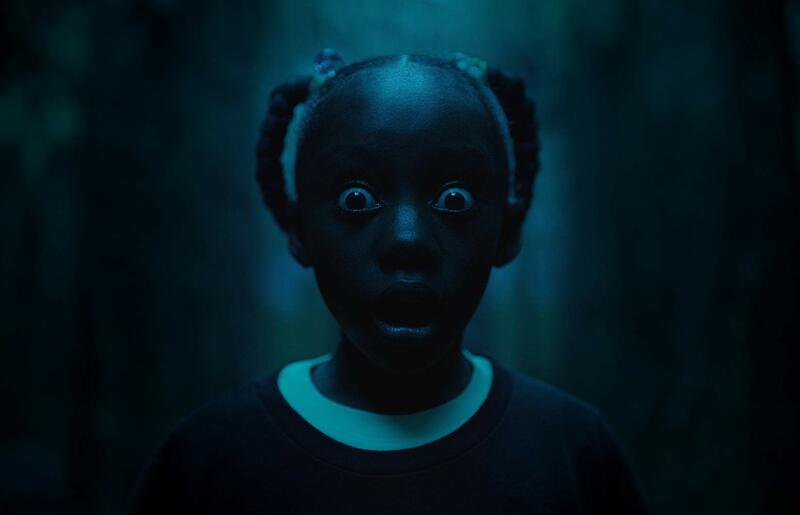 When young Adelaide (played here by Madison Curry and by Lupita Nyong’o as an adult) first meets her other half, the mirror twin’s face is obscured by the darkness — but not so much that we can’t make out the outlines of a truly disturbing smile just before the opening sequence ends. Well, yes and no. These evil twins are just different enough to unnerve: Abraham’s beard is longer than Gabe’s, he doesn’t wear glasses, and he somehow looks taller and more imposing than his jokey counterpart. Pluto prefers fire to Jason’s would-be magic tricks, as the burned bottom half of his face demonstrates. Umbrae is just as fast a runner as Zora but has an unsettling smile etched on her face. And though Red is the only member of her underground family who can speak, her gasping-for-air vocalizations are a far cry from Adelaide’s voice. If these two families were identical to each other, it would be weird. Because they’re ever so slightly different, it’s genuinely creepy. We see this concept elsewhere in film, as the “uncanny valley” describes CGI so lifelike that the increasingly minor differences between computer animation and real life break our immersion more than something less realistic would. The phenomenon has been seen in everything from “Beowulf” and “The Polar Express” to “Avatar” and “Mars Needs Moms,” all of which have one thing in common: None of them are meant to be frightening. We’ve yet to see a horror filmmaker intentionally exploit this effect for the express purpose of disturbing his or her audience, but the first one to do so will have seized upon something truly uncanny.